Things always sound funnier when they're spoken by a puppet. And if those puppets happen to be Muppets, then it's absolutely hilarious! When you watch The Muppets Show, you actually believe these are real characters talking to you. A humble green frog, a bossy lady pig, a silly teddy bear, a patriotic eagle and 2 grey haired old guys get into more predicaments and cause more mayhem making us just laugh and laugh. You gotta love those Muppet puppets. 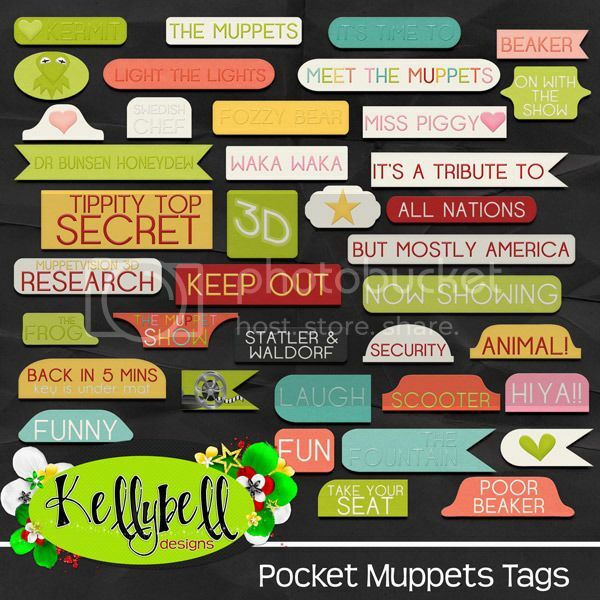 Kelly's new pocket collection today is filled with those lovable puppets. Take a look at Pocket Muppets. You'll have a blast decorating your layouts with all these adorable tags and cards. These can be used not only on pocket style pages but traditional layouts as well. Kelly has a paper pack of brightly colored patterns and solids. With all the different Muppets, you'll need alphas in a variety of colors. Here's a pack with 5 colored alphas. This new collection is on sale now for 25% off at Kellybell Designs Store. Hurry on over to grab all the items and check out all the kits in Kelly's Store. Seeing a layout made with a new kit always helps you to visualize what are all the possible ways to scrap with the items inside. You can see all the CT layouts over at Kelly's Blog or Kelly's Facebook Page. Here's a page that I made. Mousescrappers is hosting their annual 2015 Speed Scrap Marathon this weekend. Check out all the details HERE. Kelly is hosting a Speed Scrap on Friday 3/20 at 1pm EST (10am PST) so make sure you stop by and join the chat to say hello and get all the instructions. Plus there might be an extra coupon thrown out, hint hint. 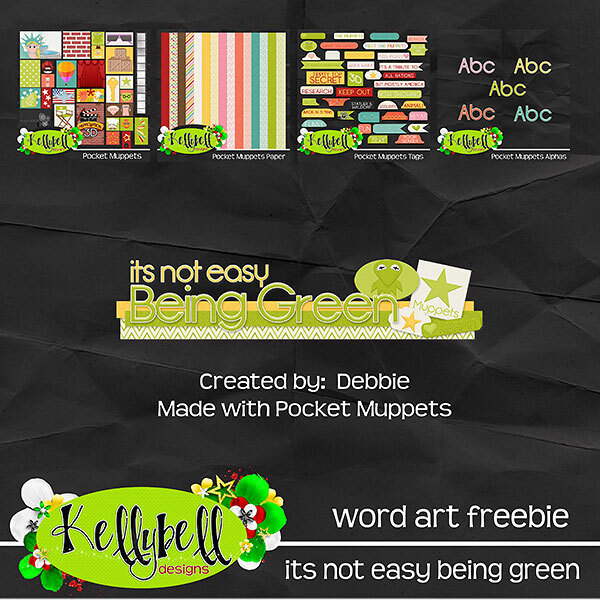 Kelly made a gorgeous word art pack as the participation prize. You don't want to miss it! CT member Jenn is hosting a Speed Scrap on Saturday 3/21 at 11am EST. Check out the amazing journal cards you'll get if you make a layout for her speed scrap. 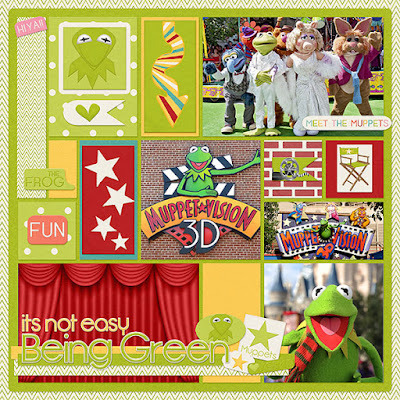 Since you'll be scrapping your fingers raw this weekend in the Marathon, you'll be needing lots of Disney scrapping kits to create some cool pages. 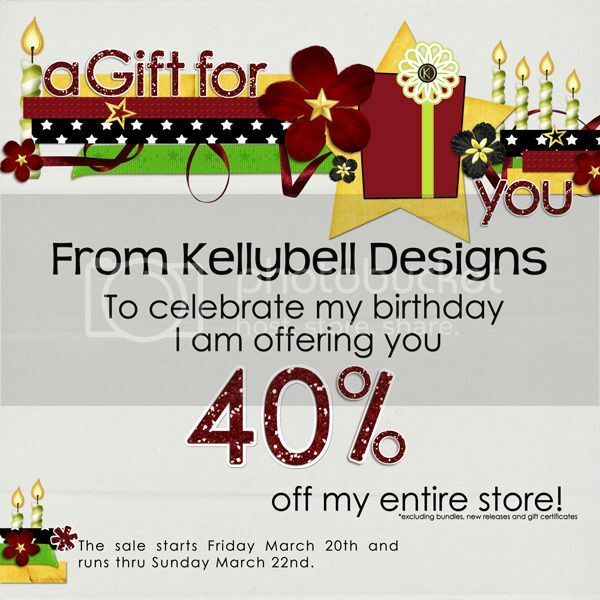 Kelly is having a 40% off Birthday sale all weekend long. Perfect timing to stock up on scrapping supplies! Take a look at all the amazing collections inside the Kellybell Designs Store. Fill up your shopping cart while everything is on sale (excluding new releases, gift certificates and bundles). Kelly's CT gals have made you 3 special gifts to go along with this new Muppets collection. You can find them over at JulieP's Blog and Roxana's Blog and mine below. Have a great weekend. Have fun shopping the sale in Kelly's store and participating in the Mousescrappers Speed Scrap Marathon. Scrap Out Loud!